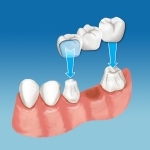 If you have a missing tooth, a fixed bridge is one of the ways to fill the missing space. It should look and feel natural, have no hooks or clasps, and stay in permanently allowing totally normal function. A bridge is constructed by preparing two crowns on the two teeth next to the space, and then the two crowns are joined together to replace the missing teeth. When teeth are missing the remaining teeth begin to change position, and this can lead to numerous problems, including loss of more teeth. A fixed bridge will prevent teeth from shifting, and stabilise your bite.